The title of Hello! ARTIST 2016 is Art Around, and it presents stories of art and what's around it. Even though 'around' could be defined to various extents, these exhibitions further focus on spaces of the exhibitions and the world of the artists. These series of exhibitions hope to communicate within relationships, stories of the spaces where artists' works are displayed, talked about, and remembered, and also stories of the artists themselves. The project Hello! ARTIST aims to support artists' sustainable works of art. This year, the Hello! ARTIST project expanded the target for support beyond its previous goals. Thus, it includes not only the artists' creations but also the major alternative art spaces where the artists' works are actively introduced in South Korean art scene. In other words, Hello! ARTIST 2016 Art Around starts this project in the hope of finding ways for artists as creator, and spaces as medium to co-exist. Naver Cultural Foundation, the board of Hello! 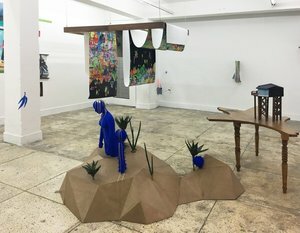 Artist, and external examiners chose four spaces (project space Sarubia, Space Can & Old House, Space: Willing n Dealing, Amado Art Space) along with total eight artists to present their unique art world. Project Space Sarubia, being selected as one of the exhibition venues of Hello! Artist 2016 Art Around funded by Naver Culture Foundation, presents The Gap Between Narrations exhibition. Under the topic of The Gap Between Narrations, Sarubia chose Sang Ho Noh and Gunwoo Shin, wishing to help them re-analyze the space, turn it into their own creation, experiment structural works, and get feedbacks over their artworks from viewers. Though Noh and Shin start from narratives that they have built through many years of work, they attempt to show new ways of displaying their works in this exhibition. Noh, excluding his original artworks, scatters printed versions of his work in the space, which is distinct from 'normal' exhibition forms. The prints of his works meet the audience at different places in the space in various ways. Shin deviates from a typical manner of displaying sculptures and instead lays his works on the floor freely to show the multi-layered structure that was condensed between abstract and shape. Their new works presented through this exhibition are to mean more than 'a result'. For them, this exhibition means a process and an experiment of projection of structural language, and a clue for moving to another narration.